Why are there weird symbols where the sharing icons should be? FooBox 2.0 welcomed in the use of font icons for the navigation arrows, close button, full screen button, loading animation, and all the social sharing icons. This enables those icons to look sharp and crisp on any size browser as well as being retina-ready. But is also means using a more modern technique which some older browsers or less supported browsers don’t implement very well. The most common reason some browsers might not show the font icons is because they have turned off the ability to allow websites to load their own fonts. 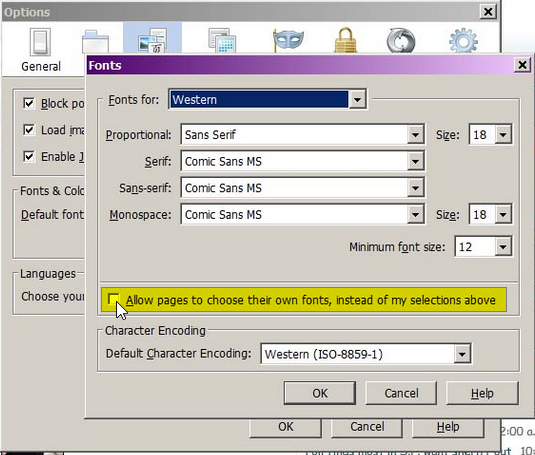 Firefox, for example, is a very well supported and widely used browser, but some security settings put the “Allow pages to choose their own fonts” settings gets set and interferes with font icons. Luckily, well supported browsers allow you to go in and change that setting. Here’s a screenshot for changing that setting in Firefox. If you are having trouble with icon fonts, look in your browser for a similar setting. The likely cause for this is that the images you’ve uploaded to your site are very large. Please verify that the images you use have been saved at an optimal file size before uploading them to the WordPress Media Library or your image gallery plugin. FooBox does not create gallery thumbnails. FooBox is only responsible for creating the modal lightbox that loads the individual images. If the thumbnail images in your gallery look distorted, it’s likely an issue with your gallery plugin or theme stylesheet. The last possibility is that you’ve uploaded a very small image and selected the “Fit to Screen” option under FooBox’s “General” tab. Unselect that, refresh the page (clear your cache if you have any caching plugins or services), and load the image again. If it is not repaired, then the issue is with the image itself or the gallery plugin (as mentioned above). This happens 99% of the time when there's a YouTube video on the page that you are loading FooBox on, and you are using an older operating system or browser. This is easily resolved by adding ?wmode=transparent to your YouTube url. Sometimes you'll have multiple arguments in your YouTube url, like "?autoplay=1", for example. In that case, make sure to put the "wmode" argument first in the url. Check to see you have the correct FooBox settings enabled. 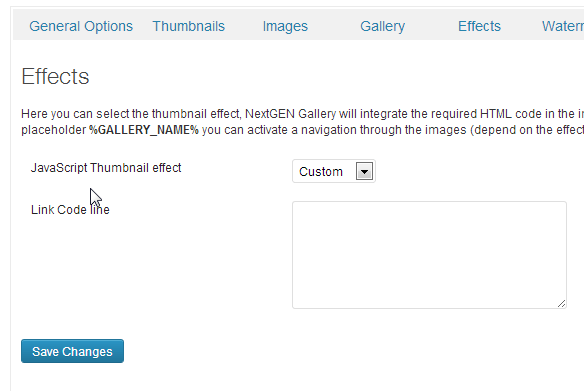 If you are using NextGen, make sure you have enabled the NextGen setting etc. The problem happens because FooBox hides the scrollbars when it is active, and then when it puts them back again, the browser goes a bit crazy and puts double scrollbars. To stop this from happening, make sure to uncheck the “hide scrollbars” option in the FooBox settings page. That will stop FooBox from hiding them in the first place, so when FooBox is closed, it will not try to put them back. Is FooBox compatible with NextGen 2.0? Yes it is. As with any major plugin release, there are bound to be bugs and quirks when updating to NextGen 2.0. So far, in all of our testing, all NGG galleries we’ve had FooBox on kept working seemlessly after we upgraded to 2.0. But there are some significant changes to the way NGG works in 2.0 that we thought needed addressing. Read the full post on it here. How Can I Integrate FooBox with NextGen Gallery? Go to the “Options” Menu under “Gallery” in your main left-hand menu. Then select “Custom” from the drop-down menu there and save. Next you want to make sure that your captions will appear correctly and be shared in the various social media outlets correctly. Other lightbox plugins are integrated tightly into some themes and plugins (like WooCommerce). 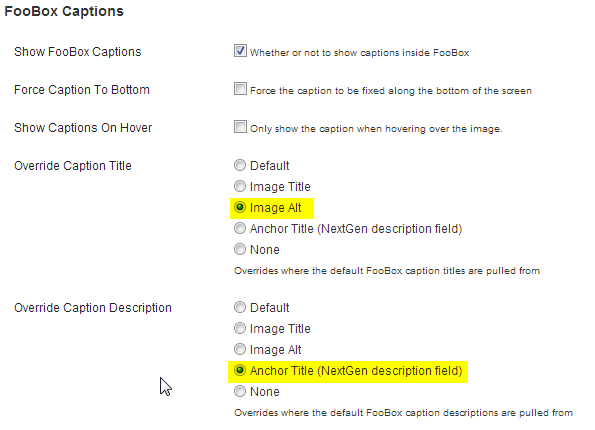 Try to disable them from your theme’s option page, but if you cannot then FooBox might be able to help. I’ve tried everything and my theme’s lightbox just won’t turn off. What do I do? There are some cases where a lightbox is integrated so tightly with the theme itself that our FooBox advanced settings can’t override it. It is possible to go into your theme files and comment out the script that loads the lightbox. The problem with doing that is every time your theme gets updated that change will get over-written and you’ll have to go and do it again. Download the Lightbox Killer here.